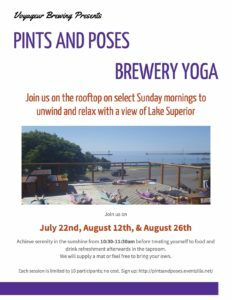 Join us at Voyageur Brewing Company in Grand Marais, Minnesota for yoga on the rooftop. Achieve serenity in the sunshine from 10:30-11:30am​ on July 22nd, August 12th and August 26th before treating yourself to food and a pint in the taproom. We have mats available or you can bring your own, either way, please register online for this free event.